When I started Chemo Headwear (www.chemoheadwear.co.uk) I started by approaching local hospitals and charities as I wanted to really help people with what suited them best. The style/shape of headwear and the colouring are both really important in creating a look that suits you and therefore creates some confidence with your new look. Most of my clients have wigs and many people find they want a wig for business meetings or dinners out but many people do find them rather uncomfortable hot & sweaty and so turn to more comfortable headscarves or hats quite quickly. Some people end up never wearing their wigs at all! It is worth looking at your wardrobe before choosing your headwear; if you wear a lot of print then choose a plain fabric, alternately if your wardrobe is very plain then choosing a print could be a good idea. Also, think of your skin tone and eye colour, this is what people will notice and picking a blue, green, grey or brown print to pick out your eye colour will be result in a flattering headwear choice. 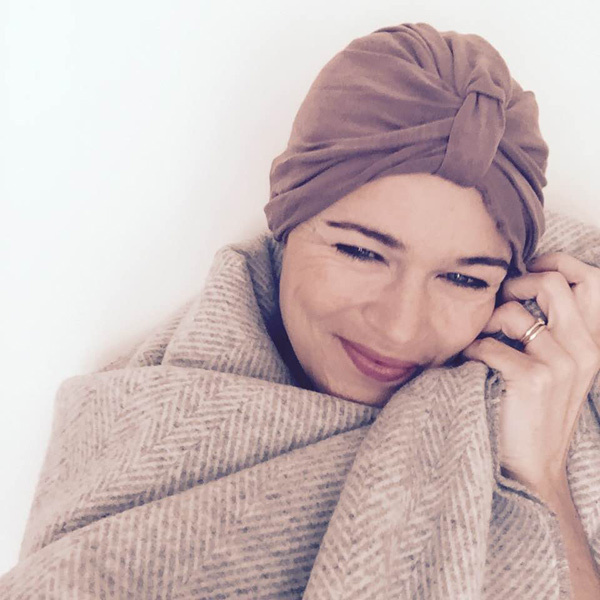 Also, think about your make-up, firstly you might need to apply more when going through chemo and if you know, for example you are going to wear bright red lipstick then pick a red headscarf or hat to complement that; same goes for pinks etc. Once, you have chosen what headgear you are going for experiment with your looks. Do you ears look better tucked in or out? Try some big earrings. Pull together some looks that work with your wardrobe & make you feel confident. One of my clients had a friend help her by taking photos of several different outfits with headscarf, shoes & bag choice and sticking them inside her wardrobe door for quick reference as she felt just too ill to think about what to pull on each morning. If you have a willing friend I think this is a great idea! As my business has grown and I have invested in a website that you can buy from I am really pleased that the majority of my customers call me as they want advice on which style might look best on them, or which fabric will be coolest for an aunt in South Africa or just to tell me a little of their life story and how their wife is awaiting the visit of her 2 daughters both who are cancer nurses. This week I had been emailing back and forth with a lady who was finding it difficult to decide which colour & style to go for and eventually she asked if it would be ok if she emailed me a selfie photo so that I could advise on her face shape & colouring? What a great idea and I hope I was able to advise and put her mind at ease, it is really hard to make these decisions when you still have hair and really don’t quite know what to expect. It is another thing to tick off the very long list before you start undergoing chemotherapy treatment.